Miss Universe 2015 Pia Alonzo Wurtzbach is now one of the Philippine Postal Corporation (PHLPost) “Living Legends” after being immortalized in her own stamp. The reigning title holder of the Miss Universe pageant was presented her own stamp frame after she turned ended her reign as the local Binibining Pilipinas Universe. PHLPost acknowledged the Filipina Miss Universe who brought home the crown after 42 years, as one of the "exceptional Filipinos who have brought pride and glory to the country and setting as role model in their chosen field." 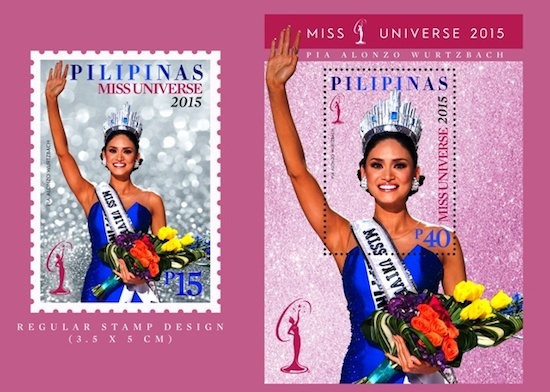 The stamp features a photo of Wurtzbach when she was crowned Miss Universe 2015 in Las Vegas last December. The souvenir sheets feature a special embellishment called tactile glittery texture embossed to enhance the important look and feel of the stamps. The glitters are on her crown which when touched will feel rough in texture. A total of 101,000 pieces of limited edition regular commemorative stamps feature the beauty queen, along with 5,000 pieces of souvenir sheets. Wurtzbach joins the elite roster of PHLPost “Living Legends” which include boxing champ Manny Pacquaio, Miss Universe 1969 Gloria Diaz, Miss Universe 1973 Margie Moran, and Miss World 2013 Megan Young. The newest “Living Legend” posted on her Instagram, "What an honor it is to join the roster of PHLPost's Living Legends. As a little background story, posts are very seldom awarded to those who are still living, which means they have seen me as someone who is worthy of this honor and who has brought pride to the Filipino community. Thank you for this." ONLINE recruitment in the Philippines declined by 24% year-on-year in March, according to employment Web site Monster.com, which tracks online job posting activity. THE CUSTOMS bureau will go ahead with a fuel-marking scheme as part of an initiative to curtail smuggling. SUGAR output for the crop season that ends in August may end up slightly higher than the government’s forecast due to the milder-than-expected impact of El Niño, the Sugar Regulatory Administration (SRA) said. PHILIPPINE companies and government agencies put cybersecurity on the back burner due to budget constraints, a local computer consultant said, as it called on organizations to “stop scrimping” on online security measures in the wake of the massive hacking of the Commission on Elections (Comelec) Web site. DAVAO CITY — Mindanao’s lead socio-economic development coordinating agency is planning around an aggressive growth assumption of 9% for gross regional domestic product (GRDP) heading towards 2030. It is barely two weeks to the May 9 elections. For months, we have been hearing many promises from the presidential candidates, and it cannot be denied that one of the things that might win over a voter is a candidate’s take on tax reform. To be sure, tax reform is one of many aspects of governance that a president needs to consider, apart from fighting crime and corruption, defending sovereign territory, and growing the economy, to name a few. But what makes many of these initiatives possible is a well-managed treasury, funded by the taxes we pay. Therefore presidential candidates really ought to speak more about what they plan to do with the tax system. INFLATION could again settle below the central bank’s target band this 2016, results of a recent central bank survey showed, but will likely log higher than last year’s rate.